The light is “powered by the energy metabolism of the plant itself." Researchers infused the plants—kale, watercress, arugula and spinach—with luciferase, the same enzyme that makes fireflies glow. They submerged the plants in a solution containing silica nanoparticles that carried luciferase, plus the molecule it reacts with to glow, luciferin, and applied pressure. Right now, the plants give off a “dim light” for four hours. The US Department of Energy is funding MIT research to develop plants that glow—in hopes to someday create plants that could illuminate whole living rooms and sidewalks from the light of their leaves. The light is “powered by the energy metabolism of the plant itself,” Michael Strano, senior author of the study, said in a press release. Researchers infused the plants—kale, watercress, arugula and spinach—with luciferase, the same enzyme that makes fireflies glow. They submerged the plants in a solution containing silica nanoparticles that carried luciferase, plus the molecule it reacts with to glow, luciferin, and applied pressure. Right now, the plants give off a “dim light” for four hours. They’re not quite strong enough to replace a lamp yet, but the researchers are hoping they’ll be able to advance to the point of being able to create plants that emit enough light to illuminate a workspace, or trees that double as streetlights. 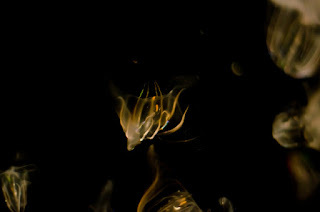 In 2013, a failed Kickstarter tried to create a bioluminescent plant. That work, lead by a former mobile-app marketer, attempted to edit the DNA of the plant itself by adding genes from fireflies or bioluminescent bacteria. Based on the public response—the project raised $484,013 from backers—people really want those glowing plants from Avatar to be real.